Although relatively new in the calendar of judo competitions, the Kata competitions have already become popular amidst judo practitioners and fans all over the world. The Kata World Championships are an important moment of the year and we are sure that all the participants will enjoy the competition. The International Judo Federation thanks the Judo Federation of Malta for organizing this event and congratulates all those involved for their hard work and reliability. I personally wish all the judoka a good competition and beautiful achievements. A few years ago, Kata was only a requirement for grading purposes and very little appreciated by the majority of our Judo membership. Most of the judo competitors never even studied it. After the European Judo Union started giving it more attention, thanks to the initiative started by the then Vice President of the EJU Sergey Soloveychik, now president, and with the support of our President Marius Vizer that we should give more attention to Judo-for-All. More Federations are now discovering the beauty and the importance of Kata. We now have a more complete Judo covering Shiai in Competitions, Randori in Training Camps and Kata now at world level. I have seen and have been involved in the development of these championships and the various experiments, trials and tribulations at continental level. My friend Franco Capelletti, always in consultation with our colleagues of the Kodokan, has gone through the difficult process of the codification of the styles and rules of judging Kata competitions. 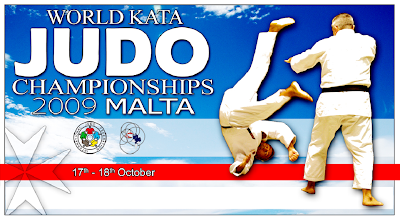 The Malta 1st World Kata Championships should culminate the work of Franco in this important section of our sport. We should also be grateful to Sensei Shoji Sukijama for the untiring effort in seeking the perfect Kata Judging System and in simplifying the Judging Techniques. I thank our President Maris Vizer for his vision and constant perseverance in keeping our sport amongst the top Olympic Sports and in his support in the concept that Judo is not only a great Olympic Sport, but also what Jigaro Kano wanted it to be, a great education tool. In this concept we find a great believer the other great Judoka, Jean Luc Rouge, my boss in the IJF DPM Commission. I have also to mention my other colleague Mohammed Meridja our Education Director who also supported the development of Kata worldwide. I welcome you all to Malta and thank you for accepting our invitation. I hope your visit will be enjoyable and memorable.